We are shocked to hear the news that former Austin Energy and Pedernales Electric Cooperative General Manager Juan Garza has taken a job promoting nuclear power with New Jersey-based NRG Energy. While Garza rightfully acknowledges the danger climate change poses to Texas, nuclear power’s life cycle carbon footprint, exorbitant cost and extreme construction time belie the claim that nuclear is a solution to the climate crisis. Numerous independent analyses warn that new nuclear reactors are too expensive, including consultants to the City of Austin who twice recommended the city pass on investment in the proposed South Texas Project units 3 and 4 due to high risk and cost. San Antonio’s CPS Energy has cut off investment in the project. Municipal utilities and electric cooperatives should take heed of the nuclear industry’s poor track record of delivering new reactors on time and on budget. The cost of these reactors has more than trebled in three years and when we built the first two units they were 6 times over budget and 8 years late. There are cheaper, cleaner, faster ways to meet new power needs in a carbon-constrained world. This is Andy checking in from Vegas and Netroots Nation: sheesh, we leave Texas for a few days and the wheels start to come off the bus, don’t they? Of course, our fearless and tireless leader, Tom “Smitty” Smith is there to handle everything, as he has done for the last 2 and a half decades. This ran in today’s Texas Energy Report, but want to give all of our Public Citizen Texas members and followers a taste if you’re not a subscriber to the Energy Report. An Op-Ed by Public Citizen’s Tom “Smitty” Smith. The recently announced new general managers for Austin and San Antonio couldn’t be more different, and may have huge economic repercussions for both cities. Austin has chosen Larry Weis, a “green” general manager from Turlock, California, Irrigation District. San Antonio’s CPS Energy has chosen Doyle N. Beneby Jr., from Exelon Corp. While Mr. Weis opposes nuclear power due to its costs, Mr. Beneby comes from a utility that has the largest nuclear assets in the country. The process that each city underwent in selecting their new managers stands in stark contrast with one another. Austin announced its finalists over a month ago and invited the public to question the candidates. CPS kept its candidates secret. In light of this lack of information, I am left to wonder what San Antonio’s fate will be given the recent track record of Exelon. Could Mr. Beneby signal the re-nuclearization of San Antonio or does he represent a future of renewable energy and green power? Although San Antonio is still reeling from the trebling of cost of expanding the South Texas Nuclear Project, the CPS board has chosen someone from Exelon, which has tried and failed to buy NRG Energy, CPS’s partner in the nuclear expansion project, while simultaneously trying to develop another nuclear plant near Victoria. While Exelon does have a mix of fossil fuel, hydroelectric, solar, landfill gas and wind generation sources, it only amounts to a meager 7 percent of its generation assets. The other 93 percent is nuclear. Today Texans proved that there is a very high demand for energy-efficient products and services when they made reservations for $23 million worth of appliance rebates in just eight hours, using up rebates in the first day they became available. This goes to show how eager Texans are to trade in their tired, energy-sucking clunkers for newer, more efficient models. Not only will this trade-in program reduce consumers’ energy bills, it also will reduce smog and global warming pollution. Given this incredible demand, we urge the Public Utility Commission (PUC) to establish another appliance rebate program like this as part of the expanded energy efficiency program the agency is currently considering. We’re sure that the numerous Texans who were unable to make a reservation are disappointed and would jump at a second chance at additional funds. In order to make the money go further, the size of the rebates probably should be reduced to assure that more people can participate. Welcome to the debut of the Public Citizen Texas Week in Review. Every day our advocacy staff works to organize citizens and politicians in order to realize our progressive vision of a healthy environment, a sustainable economy, and a government of, by, and for the people. Today’s announcement that as a part of a settlement with NRG Energy, CPS Energy will withdraw its application for a federal loan guarantee for the South Texas (Nuclear) Project (STP) expansion and end further investment in the project demonstrates nuclear plants are too costly and too risky to build. CPS Energy and the San Antonio City Council have signaled their desire to stop throwing good money after bad at STP, a message we hope will tell the U.S. Department of Energy that this plant is a poor candidate for federal loan guarantees. This debacle should show the federal government that nuclear loan guarantees are a fundamentally flawed and wasteful use of taxpayer money. At $18.2 billion, the cost of STP has already tripled in just a year. When STP 1 and 2 were built, they ended up being six times over-budget and eight years behind schedule, and STP 3 and 4 look like they are on track to beat out that poor performance record. Today’s announcement is a victory for the many citizens of San Antonio that have worked so hard in the last year to bring openness and accountability to the city’s participation in this project. We applaud CPS for wisely seeing the futility of wasting more time and energy on this flawed nuclear endeavor. We hope that they will be satisfied with the deal they’ve gotten and avoid the temptation to increase their ownership in the project. CPS has finally reached a settlement that shields San Antonio ratepayers from the financial risks of yet another nuclear deal gone wrong. Any future investment would throw that protection to the wind. On Thursday, the City Council will vote on a proposed rate increase for CPS. The City Council should put a firewall in that proposal to ensure that no unauthorized money will be siphoned off to buy a bigger stake in STP. San Antonio can’t afford to let this rate increase become a back door to continued nuclear investment. 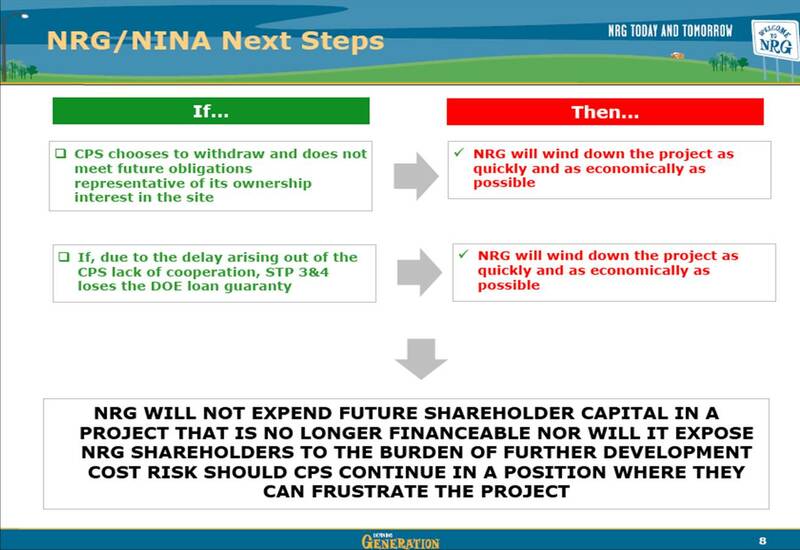 We also have to wonder how NRG will move forward, without another clearly delineated partner in the project. Less than a month ago, NRG announced that if CPS “does not meet future obligations representative of its ownership interest in the site”, they “will wind down the project as quickly and as economically as possible.” We certainly hope that NRG CEO David Crane will remain true to that expressed intent to protect his shareholders from the next financial failure in a long historic line of overly expensive, poorly executed nuclear projects. A critical court ruling today rang the first chime in what could be the death knell of the so-called “nuclear renaissance,” starting with the failed expansion of the South Texas Project (STP). This afternoon’s ruling by 408th District Court Judge Larry Noll that CPS Energy can safely withdraw from the proposed STP expansion project without losing all its investment offers the utility and the city of San Antonio the cue they’ve been waiting for to exit the national nuclear stage. Combined with the NRG Energy CEO’s announcement during a shareholder and press conference call this morning that NRG would “wind down the project as quickly and economically as possible” if CPS withdraws or STP does not receive federal loan guarantees, this news marks a major blow to those who claim nuclear power is a viable alternative to fossil fuel energy. The expansion project calls for two new nuclear reactors at a site with two existing reactors. These events give credence to the contention made over the past five years by opponents of nuclear power that it is a needlessly expensive and risky way to meet future energy needs.. In less than a year, the price of the STP nuclear expansion ballooned from around $5 billion to more than $18 billion. Given this case study of nuclear power’s failure, we must call into question the federal government’s decision to increase federal loan guarantees to support oversized, untenable projects that are already proving too risky for private investors. Public Citizen calls on both CPS Energy and NRG Energy to stop throwing good money after bad with their nuclear expansion plans and halt the project. Thankfully, San Antonio Mayor Julian Castro intervened by putting the project on hold before costs jumped too far out of San Antonio’s reach. Given the court’s announcement that the city’s interests are protected, we hope San Antonio will take the next responsible step and bow out entirely. The latest interim charge of the state Senate Business and Commerce Committee provides a welcome opportunity for Texas to rein in rogue utilities like CPS Energy of San Antonio. Now tasked with studying the costs of municipally owned utilities’ generation plans and their impacts on residential and commercial customers, the Senate committee has the opportunity to protect Texans, especially low-income families, from the machinations of a utility bent on pleasing its industrial consumers at the cost of its most vulnerable customers. CPS Energy is pursuing a risky investment in a nuclear expansion project that, depending on the final cost of the project, would raise rates between 36 percent and 60 percent over the next 10 years. The municipally owned utility has failed to adequately involve the citizenry and city government in its generation planning process. CPS Energy’s nuclear energy plan lacks any mechanism to protect consumers or low-income families, despite the fact that those customers would have to pick up the tab if the deal gets more expensive. In comparison, the city of Austin’s generation planning process spanned two years and involved public input and roundtable stakeholder negotiations, leading to the development of special policies to protect low-income families from higher bills. Policies like built-in periodic reassessments of cost and feasibility will protect Austin residents and businesses from runaway energy costs that are so typical of large-scale nuclear construction projects. San Antonio residents need to see the same protections. As Austin’s process clearly shows, CPS Energy can be much more inclusive and transparent. Public Citizen is grateful that the members of the Senate Business and Commerce Committee can step in and act as responsible figures in this process. The heart of this film is really about issues of health, future generations and the value of our own land and resources. 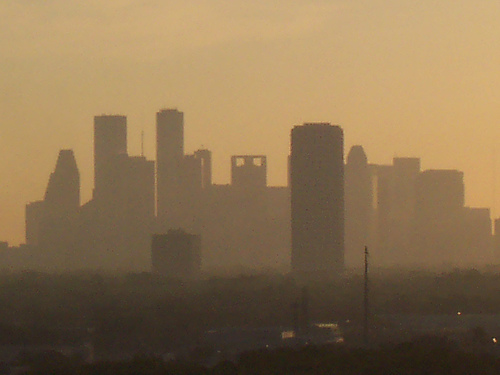 The film was made to support the story of the Texas coalition and their struggle against a giant power company. It is our way of giving other states and communities a model for what can happen when people take personal responsibility and get results. We want to let people know that they don’t have to give up hope. Though 8 of the 11 TXU plants were canceled, the remaining 3 have been built and have begun operations – and they are dirtier than the 8 canceled plants combined. What’s more, there are 12 more coal plants either in the permitting process or being built in Texas – more new plant proposals than any other state in the country. Visit CoalBlock.org and StopTheCoalPlant.org for more information. DALLAS – Environmental advocates across several states are applauding the Obama Administration’s choice of Dr. Al Armendariz to lead Region 6 of the Environmental Protection Agency, which includes Texas, Louisiana, New Mexico, Oklahoma and Arkansas. Armendariz, an engineering professor at Southern Methodist University, has worked with diverse constituencies ranging from corporations to citizens groups and has published dozens of studies on myriad environmental issues throughout his career. His appointment garnered high praise from the environmental community. In an effort to make sure EPA Administrator Lisa Jackson and the White House chose a strong environmental leader for Region 6, about twenty prominent advocates signed on to a list of principles that they hoped would guide the appointment. Dr. Armendariz was one of two candidates the groups endorsed for the position. Their list of qualities for an ideal administrator included a commitment to environmental justice and science-based policy, minimal ties to industries regulated by EPA and a strict adherence to the President’s Executive Order on Ethics, which was intended to prevent conflicts of interest between lobbyists and government agencies. Indeed, many within the environmental community see appointment of Armendariz as indicative of a new approach for the regional EPA. Dr. Armendariz will take over for Acting Region 6 Administrator Larry Starfield. During his tenure, he will face a number of pressing environmental challenges, including potentially overseeing the implementation of federal climate change legislation, bringing metropolitan areas in Texas into compliance with the Clean Air Act and working to clean up toxic “hot spots” along the Gulf Coast. “Texas needs a tough air enforcement chief at EPA 6 Dallas like Dr. Armendariz who’s willing to tackle head on the state’s serious air quality challenges with large urban areas like Dallas and Houston failing to meet new ozone standards, and who is willing to require Texas to clean up its large dirty coal plants and refineries,” stated Dr. Neil Carman of the Sierra Club’s Lone Star Chapter. Many environmental justice groups endorsed Armendariz from the beginning of the Regional Administrator selection process, citing his commitment to science, his understanding of the issues and his dedication to enforcing the spirit of environmental laws such as the Clean Air and Clean Water Acts.